This is as far as I know a pretty unique figure, at least in terms of service and equipment. Originally mastered by Pete Morton in his Jakrei range Ian at Friendship Models has keep the figure alive by converting it into the more acceptable resin format when he took over production under the Wee Friends label. I have to say at the outset I’m bias in so much as I particularly like WWII RN figures and I did provide some references, encouragement and hints when Pete was making his original range. Well nagging anyway!! There aren’t a lot of 1/35 RN Boats around to populate, but with the Italeri LCM 3 and LCVP plus the Trumpeter LCM 3 and the FM LCA they are a few choices. 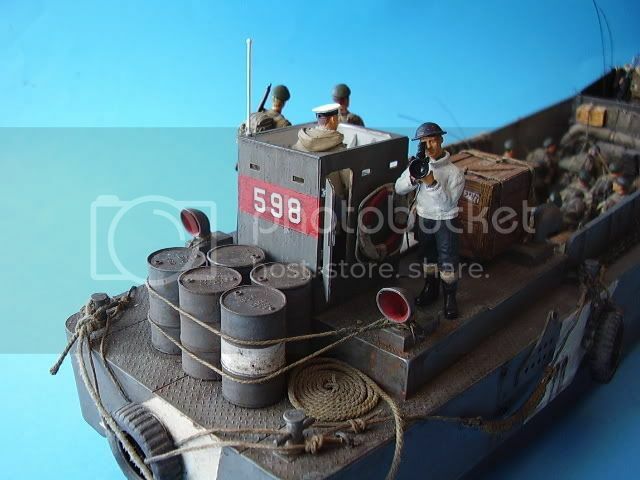 Let’s hope in the future we see another RN boat or two being added to the build options for the British Navy in 1/35. Cast in a light cream resin, the figure comes in 6 parts, the body being cast as a whole (less head and arms), is dressed in sea boots, trousers and a typical RN jumper. You get 2 heads, one wearing a steel helmet and one with a sailors cap plus the arms, and the Aldis Lamp as separate items. The casting on the body is excellent, nice folds in the trousers and jumper and the sea boots are well proportioned. This should paint up into a very good figure indeed. You get a choice of two heads, one with the sailors cap showing the face of a young man, cap pushed back onto the top of his head. The detail is quite good; all the facial features are there although the mouth is quite soft. The second of the heads is portrayed wearing a Mk I helmet, again the face is youngish, the details sharper than those on the previous head. Care needs to be taken when removing the Capped head from its pour connections. The arms come bent at the elbows, the right hand holds the base to attach the Aldis lam to and the left is palm open to support the lamp. The ends of the hands will need cleaned up a little when removed from the pour stubs at the elbows. All the parts were well cast with no air bubbles or damage. Only a minimal amount of clean up will be required to remove the pour block on the sole of the boots and there was a very faint seem line on the left leg and boot that would need dealt with. The Aldis lamp is a fairly good representation of the real thing and with some added cable to the power source should complete the figure nicely. I really like this figure, not only is the order of dress unusual, but I like the pose and the function the figure is carrying out, which is most appropriate. No other equipment is provided with the figure so you will need to consult your references for the battery and accompanying box of tricks that went with the lamp, however a simple cable running to the wheel house would most probably suffice. The choice of two heads is a nice touch. Figure painters may wish to add alternative variety by choosing from the range of Hornet heads available but the heads as provided should paint up reasonably well. 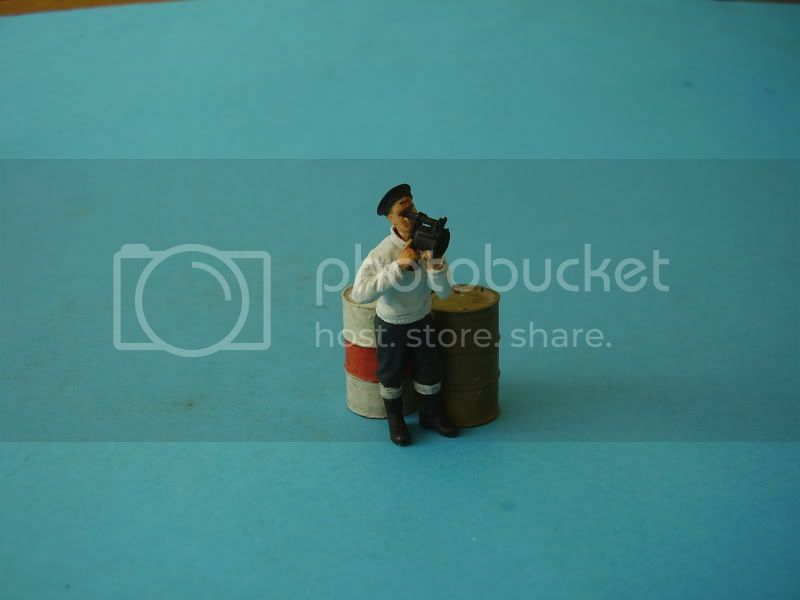 This figure will add interest to any scene on land or sea, the pose is natural and I like very much the order of dress with the sea boots and jumper, again most appropriate. I built the figure when I was proof reading this review. Make sure you use a CA glue that allows a few minutes drying time in order to allow you to line up the head, lamp and support arm. Highs: A really unusual figure, adaptable to land or sea, with a great order of dress. Well cast with good general detail, used alone or in a diorama this figure should add a lot of interest. Lows: Facial detail is a little soft.